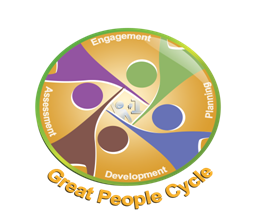 Progressive and continuous leadership development is essential to making sure that King Soopers/City Market has a leadership talent pipeline that will help us secure our future business success. The curriculum is role-specific and provides ongoing development including an emerging talent program and a tiered training approach. Our Emerging Talent Program is focused toward non-management associates with management potential within 12 months. This program gives high potential candidates a clear and defined path to leadership. Additionally, all new associates enroll in Computer Based Training, New Hire Orientation, and Customer Engagement classes at the beginning of employment. This helps new associates better understand our Customer 1st business philosophy. 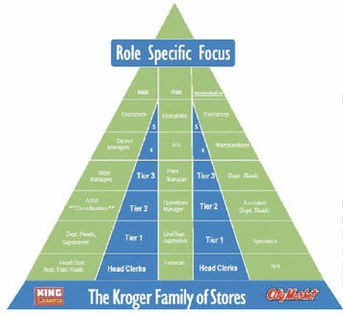 Our leadership training approach at King Soopers/City Market explores leadership skills at each level of our tiered training approach from Level 1 (Head Clerks) all the way up to Level 5 (Executives). Our management career progression starts you out as the Assistant Department Manager in one of our store departments. From there, you could move on to oversee the entire department. As you continue to progress, you could move into one of the following: an Assistant Store Manager or District Coordinator position. District Coordinators are responsible for overseeing a given area for each district (Deli Coordinator for District 3 for example.) The next progression would potentially take you to either Store Manager or Operations Coordinator. Operations Coordinator could also be thought of as Assistant District Managers because they oversee operations in every department by zone. Once you have conquered this level, you could be selected to move into either a District Manager or Merchandise Director position, with additional potential moves to Vice President positions and you could be picked to be the President of King Soopers/City Market! Don’t rule it out. Our current President moved up through the ranks. Might you be next to do the same?